Being that we focus on the old world traditions of baking, rather than the high yield, long term shelf stable product, we do not consciously incorporate trans fats in our recipes. 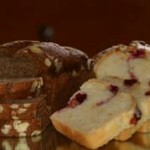 We produce our bakery items with the best natural ingredients we can source. We keep apprised of trends, fads and new sources of products and incorporate them into our offerings. The Trans Fat issue is the latest fear put into the public, and there are many theories of just how bad the trans fats are for you. First we need to clarify that when we say that we do not incorporate any trans-fats into our recipes, we mean that we do not purchase any partially hydrogenated oils. The molecular changes made to oil, in order to get the oil in order to make it solid at room temperature, are what create the unhealthy trans fats. It is essential that everyone knows that there are naturally occurring trans fats. Educating the public on the facts is never easy. We do make a few items with high quality butter. Butter is generally stable at room temperature. There will be a negligible amount of trans fats in bakery items made with real butter. 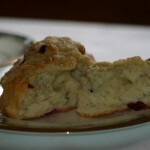 In the mean time, enjoy a scone or slice of bread with tea or coffee and rest assured that we have you and our family in mind as we develop our ideas and baked goodies.